Have you ever wanted to have a deck of cards, let someone choose a card, push it back into the pack, put 2 elastic bands around it, throw it at the ceiling, and the chosen card is stuck up there? I'm offering a free download on the Magic And More website. Possibly not; but think about how you can wow people if you could do this? So, for a short time only I have put up a free download on how to do it and you can download it by clicking this link. "It's a free download until June 1st 2017, and then it will be charged for, so go there now and get it." 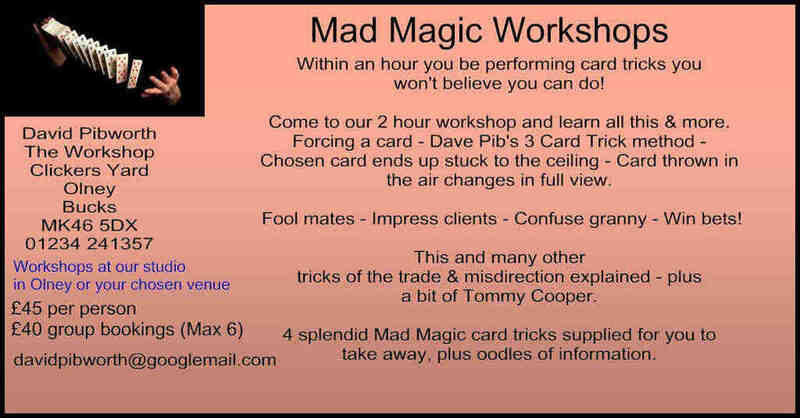 Over the past few years I've been asked to give details of how to do some of the magic tricks that I do, and obviously I can teach them face to face on our workshops, but many of our customers aren't around the corner. I have quite a few in the USA and they can't nip round to the office that easily, so I'm working on downloads and video's, and this is the first download, so it's a special offer. Most of the magic I do doesn't involve a great financial outlay. In the case of the Card On Ceiling gag, you will need a special pack of cards called Svengali Cards and a couple of other things, but there is a deal on the download if you don't have the cards, and an explanation of how the cards work and the whole gag. You can do it with a normal pack of cards actually, but it is somewhat trickier, and with the Svengali cards you can do many other tricks as well, so it's worth it. So if you fancy seeing if you can achieve it, then get the download and have a read. If you decide you don't want to do it, well, you've not lost anything, have you? My New Magic Website Is Up And Running! Have you booked yours yet?